and here is how to make it..
Betty Crocker Cookbook for Women shares a recipe! 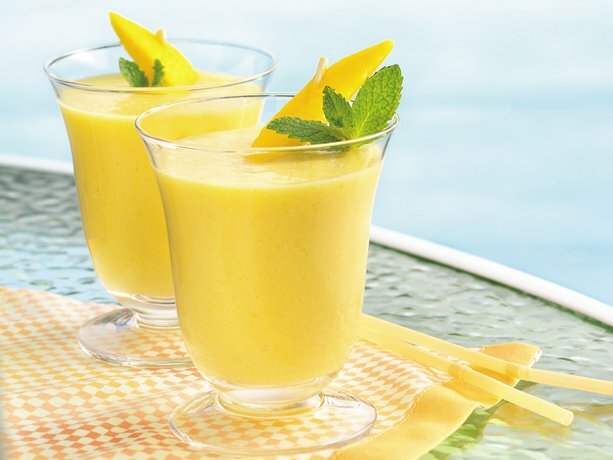 You're 10 minutes and four ingredients away from a delicious blender drink. In blender, place ingredients. Cover; blend on high speed until smooth. Pour into 6 glasses. Serve immediately. Mango adds vitamins A and C, and the yogurt and milk add calcium and vitamin D.
For the best flavor and color, choose ripe mangoes; look for skins that are yellow with blushes of red.